family gatherings and romantic retreats for couples. spectacular views are sure to take your breath away. Creek Canyon- in the panoramic region of Sedona. evening in with a log fire. bathroom and a jacuzzi bathtub. theraputic hotspa on the red rock deck. is a great favorite of children. vacation homes most unique feature's. 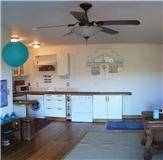 Viking oven range, Oversized sub zero freezer refridgerator, outdoor dining facilities on deck, amenities for children, jacuzzi tub in master. The house of the smiling sun offers 360 degree panoramic views - in a quiet neighbourhood .Families and pets welcome. 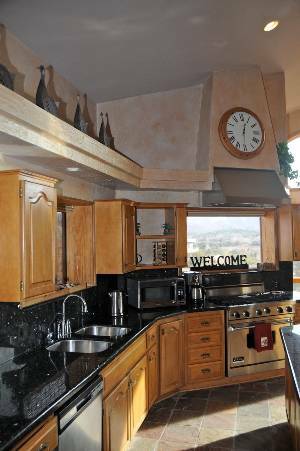 The kitchen features granite counter tops, wooden cabinetry,viking stove and grill and a sub zero freezer/ fridge. The sunlight bedroom has a king bed and a twin bed.Spectacular views. An ideal 4th bedroom for guest parties exceeding 9 guests. 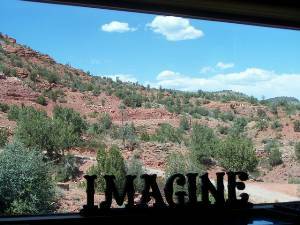 The views from every window are truly spectacular.This is the view from our kitchen window of part of the Pyramid Rock. The magnificent cathedral rock is so close to our vacation home that you feel as if you can reach out and touch it. My stay in Sedona was superb, it doesn't get much better than this. The service, house, and town was as good as it gets. 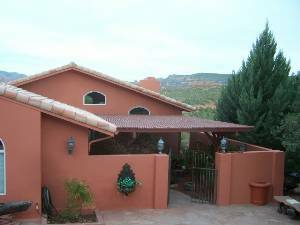 The house was stunning and interior decoration was perfect for the easy going, relaxing and healing enviroment of Sedona. The living room was spacious with a huge comfortable couch, a fireplace, and a nice big television. The dining room and kitchen were to die for! The kitchen had beautiful stone countertops, big cabinets, all the kitchen supplies i needed, and a nice dining room table for me and my guests. The outside had a spectacular balcony that i used to entertain my guests and enjoy the views.What i especially liked was that even though we were all adults we still had tons of fun on the trampoline which was provided for the children and had a blast in the jacuzzi in the middle of the red rock formations. I could be happier about this stay. i recently got married and booked this fabulous home for my family from new York.We were totally happy with everything at this home and it exceeded our expectations in so many ways.Firstly the manager of this home went out of her way to take care of details and my family very much appreciated her help with childsitting, extra services and referrals we needed.the house was as described on the internet, impecably clean, great entertaining area´s, comfortable, spacious and welcoming.the children loved the garden and outdoor area´s best and my parents loved the luxuriousness of the master bedroom and the kitchen. This house is located in a very upcsale area close to a park. That was a plus for us as we could walk our dog and the children loved the activities in the park. There are great restaurants too. CVheck out wildflower cafe for breakfasts and The Hyatt for fine dining. 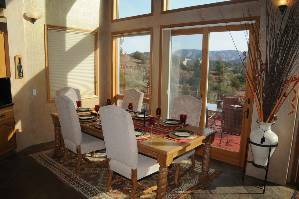 We highly rcommend this home and if we ever need to hire a place for 8 or more guests-we would certainly stay again. I dont usually write reviews -but when invited to write one for this home -it was a pleasure to do so.Firstly, the young lady that manages the home was the very best and made the trip an awesome experience.She really exceeded all expectations -providing us with details about activities in the area suitable for our group which ranged in ages from 3 to 79 years. We loved all of her recommendations.the house itself is just stunning inside and out.The views are to die for.the home was clean to a high standard, the beds are comfortable and the locaion is outstanding. The rocks themselves are so close -its a photographers paradise. We stayed a month and wished we had longer-the area is magnificent and there is so much to do.I rate this house and its manager highly . my family spent a month in this vacation home in sedona and all i can say is Wow!...what an incredible place....The views are so outstanding that i didn't want to leave.The house is just 10 minutes from town and has the best of all worlds...it is on the side of a canyon and the views are panoramic....the best that we saw in sedona.The inside of the home is spectacular as well....There is total comfort in the bedrooms and living room.We spent many nights entertaining ourselves at home because there is so much to do there.Best of all was watching movies on he big screen, soaking in the hotspa under the stars at night and walking to the creek.we highly recommend this great home and feel sure you will love it as much as we did. Discounted for couples- two adults only. Discounted for bookings of less than a week. Discounted for stays over a month. 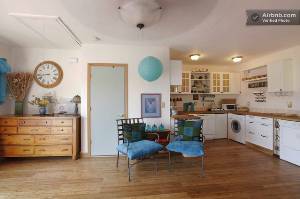 Cleaning/laundry/spa service fee-$160 to $275 depending on number of guests. Deposit: $400 - for guest parties which include children, pets or maximum guest groups. Cancellations and Refunds: Full refund if notice given in writing before 30 days of arrival date less [10% admin fee].less than 30 days notice -refunds apply only if your dates are re booked.